Ah, seafood. If you read my post about the seafood tower in Cancale, then you know I’m a bit obsessed. And there is no where better to be in the world than Brittany if you’re a fan of shellfish or fruits de mer as the French say (which translates as “fruits of the sea” – such a poetic language!). I met my friends at the open-air market, as per our usual Saturday tradition. For the first time in far too long we were all in one place, all healthy, and all available to have one of our treasured “girl time” diner parties together. 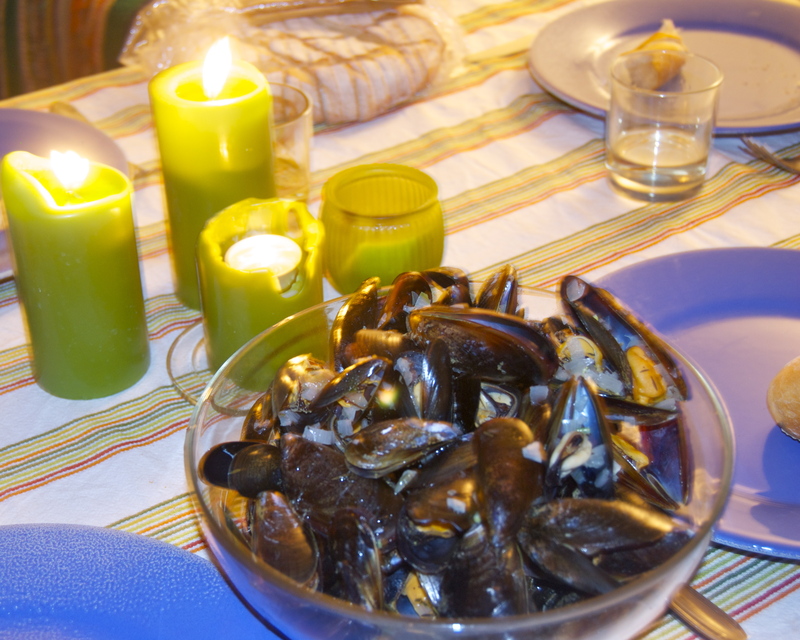 We decided to cook moules-frites (mussels and fries), one of all of our favorite classical French dishes. Can you believe that to buy mussels for 5 people, and we are talking healthy portions here, it only cost 7 euro!? And you can’t find mussels fresher or tastier than these either. Oh France, whatever will I eat if I ever have to leave you!? 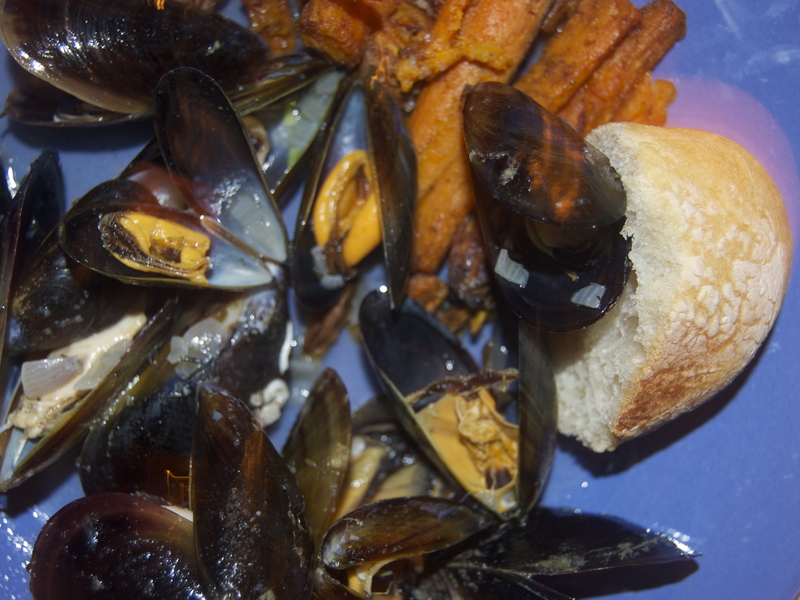 We stuck to the basics and used Julia Child’s simple Moules à la marinière recipe and accompanied it with sweet potato fries. 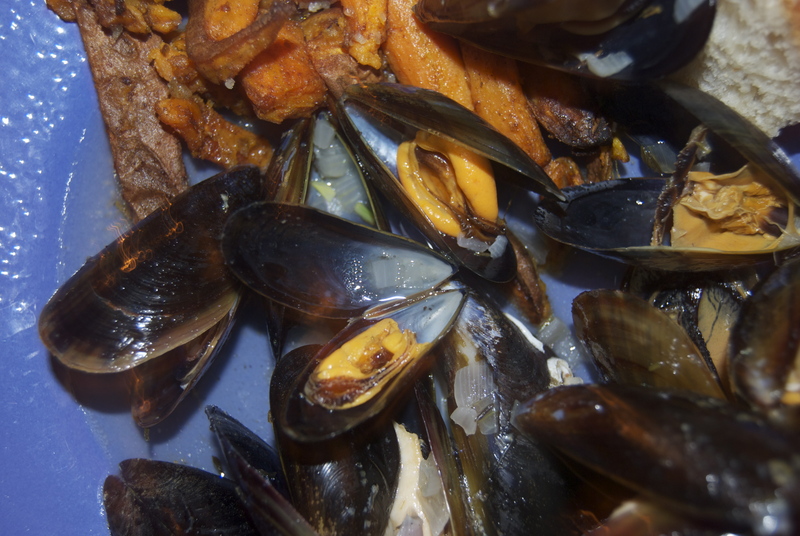 The mussels were succulent and tender, and the sauce was so unctuous and addictive that we all gorged on bread trying to sop up all of the leftover sauce on our plates. The sweet potato fries were delicious as well. 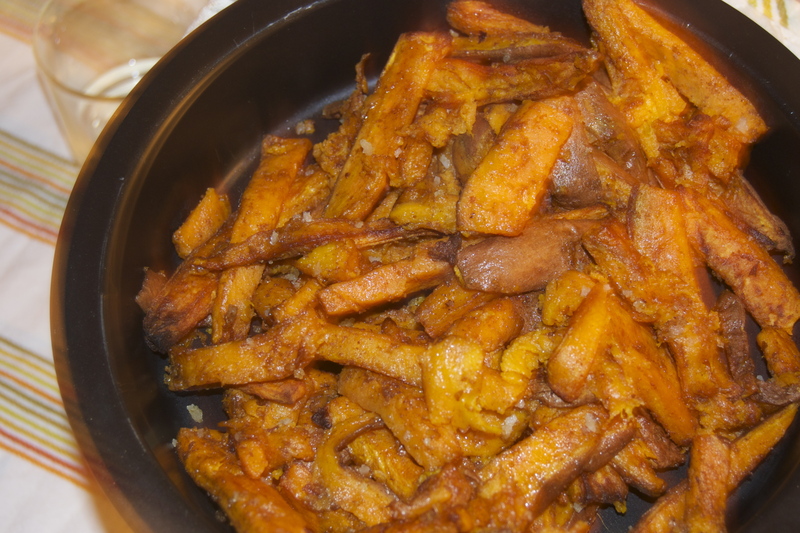 We simply tossed the wedges with olive oil, cumin, cinnamon and coarse sea salt and pepper, and popped them in the oven at 400 degrees for about 20 minutes. A testament to their tastiness: we all know that in England potato is a whole food group of its own, and the Brits love their fries (or chips as they call them – and potato chips are called crisps: confusing, I know). My British boyfriend, who had never tried sweet potato before actually said “All chips should be made of sweet potatoes!”. 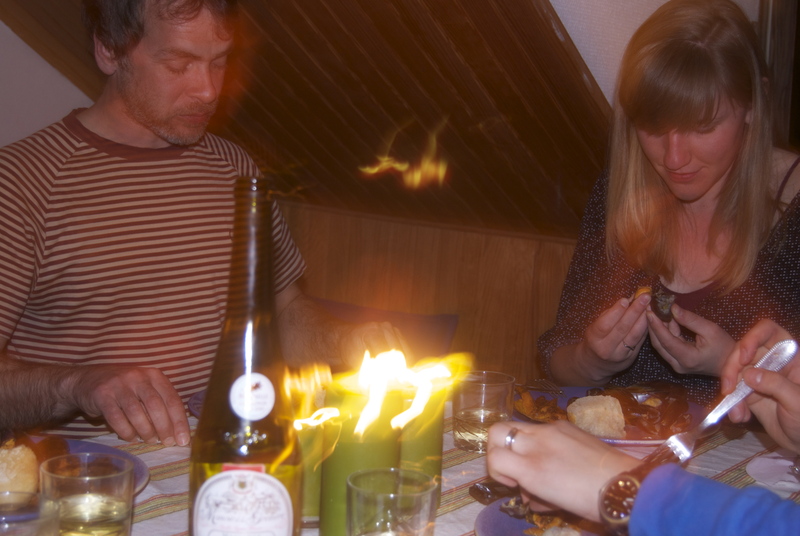 So, all in all a very successful meal – and so simple and easy and hassle free. Try it at home for a taste of Brittany and France. Well, at least around here you can get excellent locally grown mussels, so that’s one thing you won’t have to miss (if you ever come back)! 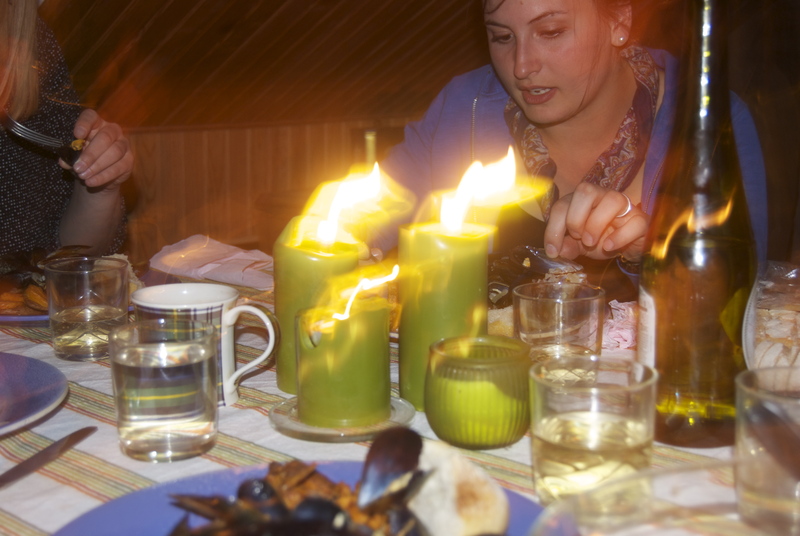 The candles in those photos look like torches, nice effect. Can’t wait to hear about the camp week. Forget the mussles. blasphemy! we could never ‘forget the mussels’. i wish you were at my table too!